Since Cydia is broken on iOS 4.2.x, the new Redsn0w 0.9.6b3 released today supports iOS 4.2.1 so that developers can make their jailbreak-apps compatible before Apple releases the final firmware to public. Using this version of Redsn0w, you can now install jailbreak-apps without using Cydia. Your jailbreak-app package however must be in a format that Redsn0w can read. i.e. gzip-compressed tar file, and it must be around 15MB in size. For our convenience, The iPhone Dev Team has released OpenSSH package in .tgz format which Redsn0w can identify. Follow the instructions below to install it on your jailbroken iOS 4.2.1 device. Step 1: Once you done with the jailbreak (instructions here), run Redsn0w again and this time select “Install Custom Bundle” & “Just boot tethered right now” options. This will prompt you to select the package you want to install as shown in the screenshot below. 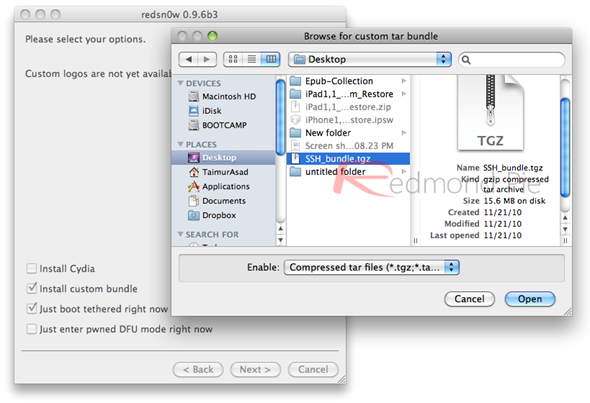 Step 2: Once you have selected the required package that you want to install, wait for Redsn0w to process the file. Now click “Next” and proceed with the normal instructions which involves entering into DFU mode. Step 3: Once done, your iOS device will reboot with SSH package install. 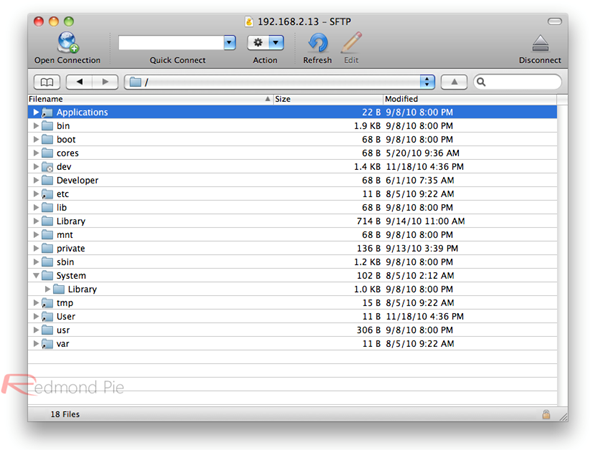 You can now use WinSCP on Windows, or Cyberduck on Mac to install to SSH into your device. Step 4: Now from here onwards, whenever you want to SSH into your device, you must first run your device in the so called “jailbroken state” on every reboot by using “Just boot tethered right now” option in Redsn0w. UPDATE 1: Follow the instructions posted here to install a patched version of Cydia after iOS 4.2.1 Redsn0w jailbreak.